Samsung is getting ready to unveil the Galaxy S9, and the phone might be the last of its name. Samsung is supposedly getting ready to ditch the Galaxy S numbering scheme in 2019, which means there will never be a Galaxy S10 if this new report is accurate. Apparently, Samsung wants to adapt the naming scheme of the Galaxy S line to present day reality and avoid awkward product names like Galaxy S11 and Galaxy S15 down the road. If Samsung is indeed doing it, then there’s obviously a good chance it’s because of Apple. The iPhone maker is in the process of changing the naming structure of its iPhone models as we speak. For the first time in iPhone history, Apple released three iPhones this year, and none of the models were named “iPhone 7s.” Apple jumped from iPhone 7 to iPhone 8 and iPhone X, with the latter pronounced “ten,” not X. 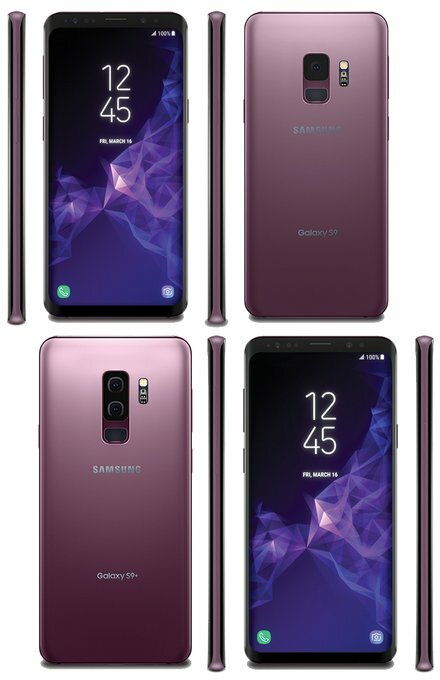 But now, Noted leaker Evan Blass, has shared several renders of the new Samsung Galaxy S9 and Galaxy S9 Plus on Twitter, along with details about what to expect from the device that will compete directly with Apple’s own iPhone X.
Samsung’s two new smartphones will continue to use the same general design as the Galaxy S8 devices, with slim bezels and a near edge-to-edge Super AMOLED display. Unlike the iPhone X, the S9 and S9+ have black bars at the top and bottom of the device, with the top bar housing components like the camera and the microphone. Rumors suggest the Galaxy S9 will feature a single 12-megapixel camera with variable aperture from f/1.5 to f/2.4, while the S9+ will feature the same variable aperture 12-megapixel camera paired with a second 12-megapixel camera with a fixed aperture. Until this point Samsung has kept the same camera on both sizes of its ’S’ handsets. While it is a small point of difference, it’s now no longer fair to say that ‘size’ is the main difference between the two handsets. Given Android places more kudos on a ‘bigger is better’ attitude, that may swing more consumers towards the Galaxy S9 Plus.